We’d love your help. 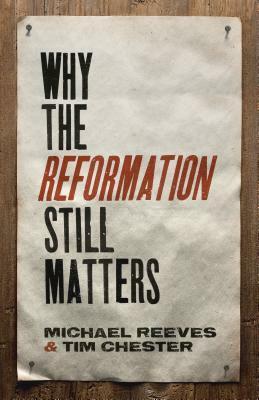 Let us know what’s wrong with this preview of Why the Reformation Still Matters by Michael Reeves. To ask other readers questions about Why the Reformation Still Matters, please sign up. 31st October, 1517 -- five hundred years ago this Halloween -- German monk Martin Luther nailed his Ninety-Five Theses to the door of a church in Wittenberg. He had rediscovered the Bible and realised how the 16th century Roman Catholic church was departing from it, and he was determined to bring Europe back to the truth of God's Word. "I was a good monk and kept my order so st 31st October, 1517 -- five hundred years ago this Halloween -- German monk Martin Luther nailed his Ninety-Five Theses to the door of a church in Wittenberg. He had rediscovered the Bible and realised how the 16th century Roman Catholic church was departing from it, and he was determined to bring Europe back to the truth of God's Word. By contrast, faith in Jesus is all-sufficient and liberating. Then we gain union with Him! All in all, a very helpful book driving home the truths that we are justified by grace alone. I knew next to nothing about the Reformation before reading this, but on this 500th anniversary, I'd definitely recommend! Spoiler alert: the Reformation still matters. A high-level overview of the Reformation with practical applications for Christians today. Important reminders of what exactly the Protestants were protesting and interesting insights into Reformation thinking and debates. I didn't like their take on Aristotle (and Augustine by proxy). Aristotle's Ethics isn't trying to address justification (obviously), but virtue. The idea of virtue (i.e. developing good habits until they become automatic) is so foreign to our time and really misunderstood. Paul tells us to imitate him. Why? So we can grow more like Christ. I agree: you can't "fake it until you make it" (as they say in the book) when it comes to our righteousness before God, but that's not what Aristo Good book. I didn't like their take on Aristotle (and Augustine by proxy). Aristotle's Ethics isn't trying to address justification (obviously), but virtue. The idea of virtue (i.e. developing good habits until they become automatic) is so foreign to our time and really misunderstood. Paul tells us to imitate him. Why? So we can grow more like Christ. I agree: you can't "fake it until you make it" (as they say in the book) when it comes to our righteousness before God, but that's not what Aristotle (and Augustine and James K.A. Smith) is talking about when they address developing habits. Are we not told in the New Testament to choose love, patience etc. when the choice presents itself? If I choose to be patient in a situation am I trying to earn my salvation?! Is it just me, or is this a huge blind spot for the contemporary Reformed church? I believe we need to do a better job distinguishing between salvation and sanctification when we discuss this. This is a good little history of the religious differences that shaped the Reformation. 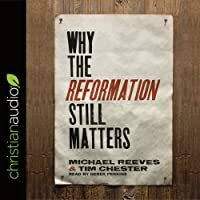 Why The Reformation Still Matters by Michael Reeves and Tim Chester is a MUST READ in my opinion. At least it is a must read for believers within the Protestant tradition. The book sets out to answer the question, DOES the reformation still matter? Their answer is YES, MORE THAN EVER! Each chapter sets out to explain to readers WHY the reformation still matters. They go through the doctrines held dear by the Reformers one by one. In the first chapter, for example, the focus is on justification by Why The Reformation Still Matters by Michael Reeves and Tim Chester is a MUST READ in my opinion. At least it is a must read for believers within the Protestant tradition. The book sets out to answer the question, DOES the reformation still matter? Their answer is YES, MORE THAN EVER! Each chapter sets out to explain to readers WHY the reformation still matters. They go through the doctrines held dear by the Reformers one by one. In the first chapter, for example, the focus is on justification by faith. The second chapter addresses the view of Scripture. The third and fourth chapters take us back to basics: what is sin? what is grace? There are eleven chapters in all. Each chapter is FABULOUS. The authors first explain what the commonly held view was prior to the Reformation. Then the authors explain what led the Reformers to change their minds. Finally the authors discuss WHY the doctrine is biblical and essential to the faith. In other words, WHY it is important for us to upheld the doctrine and reformation tradition. This one is RICH in quotes. Readers have the opportunity to read what the Reformers actually said or wrote, not merely what one person or another interprets that person to have said or wrote. This one is probably one of my favorite books of the year. I think it is VERY relevant and a great introduction to the Reformers. The Reformation still matters because eternal life still matters. Nothing matters more than justification by Christ alone through faith alone. If justification by faith seems obvious to you, then it is because of Luther. But we must not presume on his legacy. God is committed to judging sin. And that means he is committed to judging my sin. Justification is the reminder that we have peace with God and the hope of glory. And we need that reminder not just on the day of our conversion, but day after day. What is God’s Word? There is more than one answer. The first answer is that Jesus is the Word of God (capital W if you like). Second, the Bible is the word of God. The Bible is the word of God for three reasons. First, the Bible is from God the Father. It is a revelation of God the Father. Second, the Bible is about God the Son. It is the record of the Word of God in the person of Jesus, promised in the Old Testament and attested in the New Testament. Third, the Bible is by God the Spirit. It is the Spirit-inspired record of the Word of God in the person of Jesus. The Spirit ensures that it is an accurate and reliable account of the word of God. So it is from God, about God, and by God. So Christ is central to the Bible. And Christ is central to the interpretation of the Bible. All true interpretations of the Bible lead us to Jesus. The Reformation’s “deep” view of sin is rather like the proverbial ugly duckling: initially unattractive and embarrassing, but secretly a thing of promise. It is a doctrine of promise because without it Christ is robbed of his saving glory, and the gospel loses its wonder. If sin is not much of a problem, Christ need not be much of a Savior, and we do not need much grace. There is no such “thing” as grace; there is only Christ, who is the blessing of God freely given to us. Our knowledge of God is by grace alone. The only way the Reformation could possibly not still matter would be if beauty, goodness, truth, joy, and human flourishing no longer mattered. We have been made to enjoy God, but without the great truths the Reformers fought for that display him as glorious and enjoyable, we shall not do so. Seeing less of him, we shall be lesser and sadder. Seeing more of him, we shall be fuller and happier. Outstanding. Informative, insightful, and soul-enriching. Five stars if I didn't feel like it would be dated in 10 years. The blurb on the back of this book calls it an "accessible primer" of Reformation theology. It is that, although it is almost entirely about Luther. Calvin pops up only occasionally, while Zwingli appears even less (as do the Anabaptists; the Anglicans basically not at all). Thus I can't give it 5 stars. Reeves and Chester in their 11 chapters address justification, Scripture, sin, grace, Luther's "theology of the cross," union with Christ, the Spirit, sacraments, the church, everyday life, and w The blurb on the back of this book calls it an "accessible primer" of Reformation theology. It is that, although it is almost entirely about Luther. Calvin pops up only occasionally, while Zwingli appears even less (as do the Anabaptists; the Anglicans basically not at all). Thus I can't give it 5 stars. Reeves and Chester in their 11 chapters address justification, Scripture, sin, grace, Luther's "theology of the cross," union with Christ, the Spirit, sacraments, the church, everyday life, and what they call "joy and glory" in a concluding chapters. The highlights of the book are clearly the chapters on Scripture (particularly as they address preaching), union with Christ (Calvin rides to the rescue here), and the church (they have great things to say about church membership, the need to avoid schism, and the necessity of sticking it out at your church even if you don't like everything). It's October 31; it commemorates the events of October 31, 1517. On that day, Martin Luther, an Augustinian monk, pinned 95 theses to the church door in Wittenberg, Germany. He were not afraid to speak up, argued for the rediscovery of true biblical Christianity - justification by grace Christ alone through faith alone. His actions led to what we now call the Reformation. But, why would Luther do that? Does the Reformation still matter? Now, to answer these questions, you need to read this littl It's October 31; it commemorates the events of October 31, 1517. On that day, Martin Luther, an Augustinian monk, pinned 95 theses to the church door in Wittenberg, Germany. He were not afraid to speak up, argued for the rediscovery of true biblical Christianity - justification by grace Christ alone through faith alone. His actions led to what we now call the Reformation. But, why would Luther do that? Does the Reformation still matter? Now, to answer these questions, you need to read this little book! This book is reasonably short, with only 175 pages, but still I can't believe I have just read it in one-sitting. I simply couldn't put it down!! Almost equal parts history and theology, this is a good book for those looking for a basic understanding of Reformation theology and why what the Reformers fought for still matters today. For me, the biggest negative to this book is that the authors focus on Luther and mention other Reformers mostly when they either want to back up Luther or show that there was a plurality of beliefs among the Reformers. This was actually pretty good, giving a good, basic introduction to the Reformation, why it was important, and why the issues that were at stake weren't just quibbling, but essential to Christianity. Recommended for those who want to find out about the Reformation or who question its importance. I was looking for an introduction to the Reformation when I found this. I couldn't be happier. Aside from providing a history it included a lot of thoughtful analysis, not just about why the Reformation matters but why it still matters in the day to day lives of Protestants. What I appreciated most was understanding the theological positions and circumstances of that day. It helped to paint a picture of why they did and said what they did. It was well written and had a logical flow. I'd recommend it as a helpful read. It is not a thorough review of reformation thought but a helpful reminder of some of the critical ideas which remain relevant into the 21st century. More of a pastoral text. 2017 had to have a book like this. I'm glad Reeves and Chester wrote one that, though a bit perfunctory and ecumenical, is a otherwise solid. There's nothing new here, but that's the point, isn't it? Listened to the audiobook. It was very good! Good book to read for the 500th anniversary. An excellent summary of the issues around the Reformation and their relevance for today, along with a challenge to live in the light of the glorious truth of justification by faith alone. Very easy to read survey of the Reformation and why it matters in21st century America. Well written and it does not shy away from difficult topics. Good year to read this book. The central point that Mike Reeves and Tim Chester seek to make in this book is that the Reformation is still relevant today, and indeed is still in progress. They point out that the modern world finds the Reformation alien, which says as much about us as it does about the Reformers: “It exposes our preoccupation with this material world and this momentary life. If there is a world beyond this world and a life beyond this life, then it does not seem to matter very much to us— out of sight, out o The central point that Mike Reeves and Tim Chester seek to make in this book is that the Reformation is still relevant today, and indeed is still in progress. They point out that the modern world finds the Reformation alien, which says as much about us as it does about the Reformers: “It exposes our preoccupation with this material world and this momentary life. If there is a world beyond this world and a life beyond this life, then it does not seem to matter very much to us— out of sight, out of mind.” The Reformation still matters therefore, because eternal life still matters. Sixteenth-century Catholics and Protestants both acknowledged they had much in common, but they also knew the differences between them were fundamental and could not be ignored. This book outlines some key emphases of the Reformation and explores their contemporary relevance, precisely because the same issues remain as real and significant as they were 500 years ago. Luther’s key insights were that righteousness is a gift that is entirely external to us in origin; the first part is a rediscovery of Augustine and the second a rediscovery of Paul. Crucially, Luther saw that “justify does not mean to make righteous or to change a person, but to reckon righteous, to declare righteous, to acquit. Justification is about my status before God, not what God does within me.” This is the language of the law courts, and is about God declaring us righteous. 1. Justification is a forensic act by which a believer is declared righteous. Justification is not a process by which a person is made righteous. “Forensic” means legal—it invokes the image of a law court. It involves a change of status—not a change of nature. 2. The cause of justification is the alien righteousness of Christ. It is not inherent within a person or in any sense said to belong to us. It is “imputed” or reckoned to us. It is not “imparted” or poured into us. 3. Justification is by faith alone. We can contribute nothing. Christ has achieved everything for us already. 4. Because justification is an act of God and because it is based on the finished work of Christ, we can have assurance. Justification is future in orientation: it is acquittal on the Day of Judgment. But justification is the assurance in the present that the final verdict will be in our favour. They then move on to consider sanctification, as Luther argued strongly that while we are not justified by works, works should follow faith as its fruit. Saving faith will always be active in love, and this love is not expressed in religious duties to earn merit before God, but in practical service of our neighbour. Justification and sanctification are both fruit that flow from our union with Christ, which we experience through the Spirit. Sola Scriptura, “Scripture alone,” is one of the key slogans of the Reformation. It does not mean that other things cannot inform our theology; the Reformers themselves quoted past theologians freely as authoritative guides. What Sola Scriptura means is that when it comes to ultimate and final authority, we must defer to scripture alone. It is the supreme authority, in contrast to the authority of the church and its traditions. The Reformers believed in the authority of the historic church. They did not want a rampant individualism in which all interpretations of Scripture are equally valid, instead valuing the history of the interpretation of Scripture. The Reformers also believed in the ongoing authority of the church, but this authority is tied to and limited by God’s Word. The Catholic Church defines the church in terms of institutional continuity—your bishop was appointed by a bishop who was appointed by another bishop, and so on. Conversely, the Reformers said that what defines a true church is gospel continuity. What is God’s Word? The first answer is that Jesus is the Word of God, the second is that the Bible is the word of God, given by and revealing the triune God. It is the Spirit-inspired record of the Word of God in the person of Jesus. For the Reformers the Bible and Christ went together. We are saved by Christ alone, but we encounter Christ in the Bible. Christ is the incarnate Word and the Bible is the written word. The Bible is the word of God because through the Spirit it testifies to the incarnate Word. So Christ is central to the Bible, and is central to the interpretation of the Bible. All true interpretations of the Bible lead us to Jesus. Further, when the Word of God is preached, we both hear God’s voice and experience his presence. Preaching itself is God’s word, in so far as it reflects scripture, and is an integral part of God’s plan of salvation. Salvation is achieved through the cross and resurrection, but it is distributed through the Word and by the Spirit. Without this distribution no one would be saved. An important related point is the concern (particularly relevant today) about the relationship between subjective experience and objective reality. The two are linked because God has made us and then remade us to know him. Our knowledge of God is distorted and corrupted by sin, and as a result we need Scripture. However, because we reject the truth in our sin we also need the regenerating work of the Holy Spirit. We use our natural faculties to understand Scripture because its meaning is clear rather than coded, but we also need the inner testimony of the Spirit to authenticate this to us as God’s Word. The result is a grace-centred, Trinitarian hermeneutic. This high view of preaching, in which the preaching of the Word conveys the voice and presence of Christ is not a high view of preachers. Preaching is a human act, and as such is fallible. This means that preaching is not the word of God in the same way that the Bible is the word of God; it is an administration of God’s Word and an extension or application of God’s revelation in Jesus testified in Scripture, rather than a second or rival source of revelation. All preaching must be weighed according to the standard of God’s infallible word in the Bible. The idea that sin is not a very deep problem chimes well with today’s cheery optimism about ourselves. We all know that we do some wrong things, but the suggestion that we may be rotten deep down strikes us as utterly repellent nonsense. This is just where many would part ways with the Reformation: God’s saving people out of his sheer loving-kindness sounds wonderful; but people needing to be saved because they are otherwise helpless in their sin sounds less pleasing. It is crucial to understand that while the believer will grow more Christlike over time, we will never be more righteous. Because of Christ, and not because of our performance, the sinner can know a despair-crushing confidence; salvation by grace alone is simply another way of saying salvation by Christ alone. Another important question asked by Luther is this: How can we know God? While there are some visible things humanity could look at such as creation, spiritual experiences and miracles, Luther says that they do not reveal God. Luther’s answer is this: God is known through what is contrary. He is known in a hidden way. God’s invisible attributes are revealed in suffering and the cross: glory in shame, wisdom in folly, power in weakness, victory in defeat. God is known through the message of the cross. What Luther calls “the theology of the cross,” is not so much an understanding of how the cross saves us, but is an approach to knowing God. It claims that knowing him starts with the cross. The opposite of the theology of the cross are theologies of glory. Theologians of glory pursue wisdom, experience, and miracles and say that suffering is bad. The theologian of the cross values suffering as that through which God is revealed. Knowledge of God is not found through human wisdom, human powers, or human achievements, but in the foolishness of the cross. 1. The theology of the cross is a theology of revelation. It stands in contrast to speculation. 2. The revelation of God in the cross is a hidden revelation. It is indirect. 3. The revelation of God is found in the cross of Christ. It is not found through human works or reason. 4. God is therefore known only by faith. 5. God is particularly known through suffering (both the sufferings of Christ and the sufferings of the individual. God humiliates us so that we may know him). This sits in stark contrast to the Reformers vision of the Christian life as a life of power in weakness, lived in conscious dependence upon the power of God mediated by the Holy Spirit. In Reformation thought, union with Christ is a fixed and therefore stable thing, the solid foundation on which we can know lasting joy. This is different to communion with Christ, which is the actual enjoyment of Christ and which does fluctuate in believers. Calvin saw the Christian life starting with union with Christ, with a key image being that of the vine: “Jesus Christ is the Vine, filled with the love and life of God. Unattached to him we have no spiritual life whatsoever. But “engrafted” into him like branches, we have, undissipated, all the life and love he enjoys.” For Calvin and the mainstream Reformers, union with Christ was the radical solution we need given the radical problem of sin. Belief in the Spirit meant that the Reformers did not simply have some slightly alternative message or system; it meant people would personally know Christ. For the Reformers the Spirit not only gives a new heart, a new life, and a new enjoyment of God; he also gives a whole new assurance. Deep heart metamorphosis instead of superficial behavioural change, personal communion with God instead of abstract blessing, and joy-inducing assurance, were some of the vital benefits of the Reformers’ theology of the Spirit. The Roman Catholic doctrine of transubstantiation is not a random addition, nor is it simply superstition. It is a natural corollary of the Catholic view of salvation. If sin is a disease, and salvation is primarily an act of healing, then the sacraments are the medicine. The wafer on the tongue is like a pill. Or, to change the metaphor, going to the Mass is like going to a petrol station to get more fuel for the journey. This is because, in making grace a “thing” you could transfer, it was natural to view the sacraments as the means by which grace was transferred. There are two opposite dangers in how we view the sacraments. First, the Catholic Church says that grace is conveyed through the sacraments ex opere operato, “from the work worked.” In other words, the sacraments work apart from faith. The opposite danger is that of correlating the efficacy of communion to how I feel about it. If I am moved by the Supper, then it is effective. If I am unmoved, then it is ineffective. So, in this view, what makes it effective is my experience, in other words what makes it effective is me. In correcting both these wrong views we need to understand that the gospel is entirely outside us, and describes the objective reality to which I am to respond. This is reflected I nthe sacraments, which are really embodied promises. Luther said that the church is not defined by its institutional structures, nor by its historical lineage. He maintained that there are two marks of a true church: the gospel and the sacraments. In other words, a true church is one that both faithfully proclaims the gospel word from the Scriptures and faithfully administers the gospel sacraments of baptism and communion. You are not saved by being part of the church; you are part of the church by being saved. For the Reformers these marks were also an indicator of when one should leave a church. The Reformers would also have encouraged us to see the marks as criteria to determine which church we should join. In other words, the key factor when deciding which church to join is not the style of worship or provision for children or the charisma of its leaders, but the gospel. Calvin correctly added a further mark in church discipline. While emphasising the importance of gentleness and restraint in church discipline, he is clear that it is vital to avoid bringing dishonour to the name of God, to avoid other Christians becoming corrupted and to bring the person concerned to a state of repentance. While we do not have to control our bodies so we can attain heaven, we do still have to live “this mortal life on earth,” and spiritual disciplines are important to ensure that our outer lives conform to our new inner status. We also want to serve God joyfully because of the benefits conferred on us in Christ. One important outworking of this is the idea of the priesthood of all believers. This is often misunderstood to mean that there are no offices in the church or that every individual is his or her own priest, accountable to no one else. For Luther, the priesthood of all believers is never about being alone and always about being together as a united church. It is a responsibility as well as a privilege, a service as well as a status. A second important idea is that of calling or vocation. This was used in the medieval period to describe religious orders and sacred ministry. Luther took the term and reapplied it to the activity of all Christians in whatever context they found themselves. For Luther, vocation is much more than simply a call to do your job well. Today the term is used narrowly to mean your profession or job, but Luther used it to describe every social activity or function. It is a call not just to fulfil our responsibilities well, but also to see God at work throughout human social interactions. In the modern world work has become an end in itself, and in many ways it has become a god offering salvation in the form of self-fulfilment. We look to find meaning or our sense of worth through work itself. The Reformation affirmation of everyday life, in contrast, is an invitation to see the whole earth as the theatre of God’s glory and to see our whole lives as opportunities to reflect that glory. A timely book I read in light of the 500th anniversary of the Reformation, though this book was published a year ago (2016). This book is written with the general Christian readers in mind and argues that the Reformation still matters and why it matters is because the doctrines recovered in the Reformation are biblical and has implication for our lives today. Whether you are a general Protestant or you are new to Reformed theology or you are a seasoned saints in a Reformed church or a non-Christ A timely book I read in light of the 500th anniversary of the Reformation, though this book was published a year ago (2016). This book is written with the general Christian readers in mind and argues that the Reformation still matters and why it matters is because the doctrines recovered in the Reformation are biblical and has implication for our lives today. Whether you are a general Protestant or you are new to Reformed theology or you are a seasoned saints in a Reformed church or a non-Christian curious about Christianity this book would be edifying for all who read it. While this book is pretty basic concerning Reformed theology I found that even as a pastor who daily read Reformed writers I was much encouraged in the faith by this work. The book consists of an introduction followed by eleven chapters with each chapters covering different doctrines that are part of the Reformed faith. Chapter one was on justification while chapter two was on Scripture and chapter three on sin. Chapter four was on grace, chapter five was on theology of the cross while chapter six was on Union with Christ and chapter seven was on the Spirit. Chapter eight was on the sacraments, chapter nine on the church, chapter ten on joy and glory and finally chapter eleven was on joy and glory. The chapter on justification made a observation that I have not thought much about before that the doctrine of assurance of salvation sounds really arrogant if you believe that salvation is by works rather than grace; that is because saying you know you are saved in a theology that is saved by works would make one sound very presumptuous. But someone who believes in salvation by God’s grace alone and is assured of his or her salvation is not prideful and self-boasting; rather on the contrary such a believer if he or she must boast is boasting in Christ. The end of chapter one on justification also ended with many helpful applications. The book argues that this doctrine is not just a church issue but one that is practical toda since many people are trying to self-justify themselves before God and others. But the Gospel in the Bible liberates us from that since justification is a work of God and is a gift! Chapter two which covers Scripture also had a great discussion of the relationship of God’s Word and preaching. A good point was made that preaching is not primarily about teaching (though it does take place) but instead it is meeting with God like a bride wanting to hear the reassurance of her husband in their relationship. I thought that was a beautiful imagery and reminded me as a pastor that the Word of God is about the presence of God. Chapter three gave an interesting illustration that we must have a right view of sin and how that is so important with the example of the ugly duck and how before it can be a swan it first begin with something not as pleasing. Likewise the Gospel begins with the bad news first of the reality of our sin and shortcoming; only do we see our sins rightly would we see the need for God’s grace. More than once the book mentioned that grace is not like red book of God’s work in our lives, even though many people think of it that way. This can be seen many times in chapter four which talked about grace but it also appeared in a few other instances in the other chapters. Chapter six has a good explanation of the doctrine of union with Christ. Here the book also explained how Catholics and others also have a doctrine of union with Christ but not necessarily a biblical one. In the Bible and in Reformed theology there is a distinction between union with Christ and communion with Christ in which our union with Christ never changes as a Christian even in our worst of days while our communion with Christ is our enjoying of the privilege of being united with Christ and is more dynamic. "The reformation is over! ", many suggest. "There is no more need for squabbling over small matters." Is there no more need to dispute? And were the protestations really over small matters? Authors Michael Reeves and Tim Chester address not only that the Reformation is NOT over (after all, Semper Reformanda -- always reforming), but that it MUST continue. The true Church must always be about keeping in line with the doctrines of God, and any stray teaching must be cor "The reformation is over! ", many suggest. "There is no more need for squabbling over small matters." Authors Michael Reeves and Tim Chester address not only that the Reformation is NOT over (after all, Semper Reformanda -- always reforming), but that it MUST continue. The true Church must always be about keeping in line with the doctrines of God, and any stray teaching must be corrected immediately before it tailspins out of control. As Reeves and Chester observed, "It was not the Reformers who had departed from the true church. It was Rome that had departed from the true gospel" (p.165). JUSTIFICATION: Reeves and Chester begin the book with the driving doctrine of the Reformation: Justification. To be justified is a matter of being declared right by God through the finished work of Jesus Christ, who paid the full penalty for the sins of those who would but trust him. As Reeves and Chester explain, justification "does not mean to make righteous" (as Catholic theology suggests) "or to change a person, but to reckon righteous, to declare righteous, to acquit" (p.29). A sinner, apart from Christ, cannot grow righteous and, therefore, become righteous in God's sight. No. A sinner is declared righteous, and that forgiven saint now grows in the righteousness that is already his. This is no small matter that must be cherished by the forgiven sinner, for it is the gospel of Jesus Christ. Once grasped, the truly converted can rest assured in being completely at peace with God. LAYOUT: Throughout the book, Reeves and Chester handle additional doctrines pertaining to Scripture, Sin, Grace, Theology of the Cross, Union with Christ, The Spirit, The Sacraments, The Church, Everyday Life, & Joy and Glory. The book is packed full with reference quotations from numerous Reformers (Calvin, Sibbes, and Hus to name a few), with the most prominent being Luther, of course. But it's not merely a book that regurgitates what long-dead Reformers wrote, but a careful handling of the doctrines that make Reformed Theology reformed. RESONATION: There were so many quotable passages in this book, that I wish I had the print version for easier access to those highlights than my e-reader provides. In fact, I'll probably purchase the print copy anyway. Rather than pull any number of quotes from the book to prove that it was worth the read from cover-to-cover, I'd prefer to address an area that resonated with me throughout the book. Here it is: Many -- far too many -- pastors today have abandoned teaching the true gospel of Jesus Christ, and too many congregations have allowed it to happen. Solid teaching about the real Jesus Christ of the Bible and what he accomplished seems to have taken a back seat to the jesus of the false Prosperity Gospel, Therapeutic Gospel, Social Gospel, etc. False teaching has grown rampant, and many sheep in the pews do not realize the danger they face in adopting these "other gospels". The sheep, instead, desire only to have their ears tickled, rather than be confronted by the truth of the cross. The Reformation STILL matters today, and it must continue. RATING: I give "Why the Reformation Still Matters" 5 stars out of 5 for it's biblical handling of crucial doctrines, for its clarity and readability, and most importantly, for its solid presentation of the true gospel of Jesus Christ. If you are encouraged by reading any of the Reformers' work, or reading about the Reformation and its doctrines, you'll want to add this book to your library. I chose to read this book because of the 500th anniversary of the Protestant Reformation and don’t regret it. Many of the very issues that were fault lines five centuries ago remain relevant. The authors address eleven topics in the book, and I will comment only on a few of them. First, in the chapter on the doctrine of scripture, it is noted that the reformers held a high view of preaching but not a high view of preachers. In other words, God speaks to us through the preaching of the Word by fal I chose to read this book because of the 500th anniversary of the Protestant Reformation and don’t regret it. Many of the very issues that were fault lines five centuries ago remain relevant. The authors address eleven topics in the book, and I will comment only on a few of them. First, in the chapter on the doctrine of scripture, it is noted that the reformers held a high view of preaching but not a high view of preachers. In other words, God speaks to us through the preaching of the Word by fallible preachers. This places a high burden on the preachers because they can err in their doctrine and interpretation of scripture. It also places a burden of healthy skepticism on the part of the hearers, something I have long appreciated. Second, in the chapter on the doctrine of grace, it is noted that the Catholic Church had and still has a doctrine of grace, something that many Protestants fail to recognize. The issue is the nature of its doctrine of grace, which holds that God saves by grace that is given to those who are prepared for it, grace that makes us more eager and able to become holy and win their salvation. This is not the grace that takes people who are spiritually dead in their sins and gives them life; rather, it is grace that energizes spiritually lethargic people. Interestingly enough, it reminds me of some Sunday school teaching on grace while I was growing up in an Armenian church. The teacher placed marks to represent God and man. He drew a line from man toward God that ended short of God and then stated that grace made up the difference, failing to communicate that biblical grace is the entire line and demonstrating that we Protestants have backpedaled a bit on the doctrine of grace. My final observation relates to the chapter on everyday life, which affected me in two ways. The first was the observation that how we conduct ourselves in our everyday lives and business activities can glorify God as much as worship or ministry. In a previous job, work was becoming increasingly demanding and detracting from my family and spiritual lives, a very frustrating situation that I was trying without success to avoid. After some time in this quandary, God delivered me to a more favorable work environment. During this time, I considered abandoning my occupation and going to seminary. Fortunately, I never acted on this idea, which probably would have been disastrous on account of my personality. Even so, I can glorify my God in how I live and work. Secondly, I was impressed by a quote from a Christian businessman decrying the lack of a moral vision in the church “for wealth creation as that which pays for the health service as well as gospel ministry.” I will unabashedly and unapologetically admit that I am a social and fiscal conservative who believes in free market principles as a means of wealth generation to lift people out of poverty and who is troubled by attitudes in some Christian circles in support of wealth redistribution and other anti-business measures. They have grand visions of social justice, etc., but not a clue how to pay for it other than reaching into other people’s pockets. Yes, we need appropriate rule-making to protect workers and other stakeholders, but we also need a strong economy to pay for such grandiose ideas. There is no magical money tree. October 31, 2017, will mark the 500 year anniversary of the Protestant Reformation. This quincentennial celebration is remarkable in many ways as Protestants around the world will remember the accomplishments of the Reformers, most notably the bold move by Martin Luther in nailing the 95 theses to the castle door at Wittenberg. Despite the widespread celebration of many who take delight in the rediscovery of the gospel and the great doctrine of justification by faith alone, there is an ongoing debate concerning the relevance of the Reformation for our time. Michael Reeves and Tim Chester address this specific matter in their new book, Why the Reformation Still Matters. After a brief introduction to the history and theology of the Reformation, Reeves and Chester waste no time in an initial answer to the question: “We need a stronger, not a weaker focus on Reformation theology,” according to the authors. They describe the Reformation as “a continual movement back to God’s Word.” Thus, the stage is set for the remainder of the book which will argue in no uncertain terms that the Reformation still matters. Reeves and Chester undergird their stance by pointing readers to key doctrines that were rediscovered during the days of the Protestant Reformation. They showcase the gospel systematically as they unfold the biblical reality of sovereign grace. Indeed, we are saved by grace alone, through faith alone, in Christ alone, on the Word alone, to the glory of God alone. Each doctrine is unveiled and contrasted with the historic Roman Catholic position which gives readers an opportunity to interact with two competing systems of thought. The authors are charitable and gracious but never compromise the truth. Reeves and Chester boldly present the core elements of Reformed theology; doctrines the magnify the Savior and humble sinners. Why the Reformation Still Matters is an outstanding summary of this important topic. People from all stripes, from beginning to advanced will benefit from this book. There is enough information to keep seasoned theologians and students of church history on their toes. Yet the material is not too advanced for anyone just getting started in the field of church history. The balance here is rare and should be well received by readers. Why the Reformation Still Matters succeeds and makes a positive case for the gospel-saturated truths that flowed from the Reformation and continue to impact lives in our generation. Yet, theology is more than an end in itself. “Through these truths,” write Reeves and Chester, “lives can still blossom under the joy-giving light of God’s glory.” In other words, the Reformation makes a practical difference in the lives of people. In did almost five hundred years ago and will continue to impact lives as we await the return of our sovereign king. The Reformation still matters because eternal life still matters." "Our contention is that on key issues like justification and Scripture the issues remain and are not negotiable." it does not justify; indeed it is not even faith.’ … any hope of salvation based on good works, even in part, denies the adequacy of our only true hope, Jesus Christ. For Luther justification is a forensic act. For Catholicism it is a healing act. For Luther justification comes from the alien righteousness of Christ. For Catholicism justification comes from inherent righteousness within the believer. and continued through sacraments and good works. For Luther believers are judged on the basis of Christ’s finished work. For Catholicism believers are justified on the basis of what they become. For Luther believers have an assured future. For Catholics believers have an uncertain future. This was a helpful overview of some of the key distinctions between Roman Catholic and Protestant doctrines and a valuable summary of the theological disputes that gave rise to the Reformation. With a number of friends who are Roman Catholics and who are also, from what I can tell, genuine believers—in spite of what I believe to be their doctrinal errors—I can find it easy to downplay some of the disagreements that I, as a reformed protestant, have with the church of Rome. Not that I've ever tho This was a helpful overview of some of the key distinctions between Roman Catholic and Protestant doctrines and a valuable summary of the theological disputes that gave rise to the Reformation. With a number of friends who are Roman Catholics and who are also, from what I can tell, genuine believers—in spite of what I believe to be their doctrinal errors—I can find it easy to downplay some of the disagreements that I, as a reformed protestant, have with the church of Rome. Not that I've ever thought that those doctrines don't matter, but it can also sometimes seem like we really aren't all that different. This book, however, serves as a healthy reminder that a very great deal is at stake when it comes to these points of doctrine, and it does no one—either Catholic or Protestant—a service to sweep these divisions aside as mere trifles. This is especially true when we consider that the central protestant doctrine of justification by faith alone remains officially condemned by the Catholic Church. Trent has never been overturned, and the anathemas declared there still stand. These issues are not unimportant side notes; they have a direct bearing upon our hearts and actions every single day. How, for example, can we rejoice in the Lord always if we can never be certain of our standing in the Lord? And, for that matter, what is the source of that standing—our own good works mingled with Christ's death plus some overflow from the stockpile of grace stored up by the saints in heaven? Or nothing but the blood of Jesus? Do we have access to God, to boldly approach the throne of Grace, or must our access be mediated through priests and saints? How can the Roman church teach that our sins will be purged away for untold years in purgatory unless they believe that Christ's blood was, in some way, insufficient for an ample washing away of sin, removing our transgressions "as far as the east is from the west"? This book addresses these and many other questions raised by the work of the Reformers, and the answer to each of these questions still matters—as much today as it did 500 years ago when Luther first hammered a nail to a church door at Wittenberg. The authors write that at the heart the Reformation was a dispute about how we know God and how we can be right with him. Our eternal future was at stake, a choice between heaven and hell. For the Reformers there was no need more pressing than assurance in the face of divine judgment, and there was no act more loving than to proclaim a message of grace that granted eternal life to those who responded with faith. Though many will tell you that the Reformation doesn’t matter or even was a bad idea The authors write that at the heart the Reformation was a dispute about how we know God and how we can be right with him. Our eternal future was at stake, a choice between heaven and hell. For the Reformers there was no need more pressing than assurance in the face of divine judgment, and there was no act more loving than to proclaim a message of grace that granted eternal life to those who responded with faith. Though many will tell you that the Reformation doesn’t matter or even was a bad idea, the authors tell us otherwise. They state that the Reformation still matters because eternal life still matters. In addition, the Reformation still matters because the debates between Catholics and Protestants have not gone away. The authors outline some key emphases of the Reformation and explore their contemporary relevance. Subjects covered by the authors include the sacraments, the preaching of the Word, sin, grace, the cross, union with Christ, the Holy Spirit, the church, vocation, Purgatory, indulgences, justification, and the authority of scripture in comparison with the authority of the church and tradition. As strange as this sounds, I was completely enthralled by this book. The narrative through history is seamless, logical, and ripe with thoughtful conclusions for each of the church's decision, regardless of denomination. Even though this book has a particular denomination in mind as the correct winner of all subsequent arguments, I felt that the most profound truth lay in the arguments that started the division. To paraphrase: I am right because I say scripture says ______. You are wrong because As strange as this sounds, I was completely enthralled by this book. The narrative through history is seamless, logical, and ripe with thoughtful conclusions for each of the church's decision, regardless of denomination. Even though this book has a particular denomination in mind as the correct winner of all subsequent arguments, I felt that the most profound truth lay in the arguments that started the division. To paraphrase: I am right because I say scripture says ______. You are wrong because you don't agree. There is no salvation outside of the [correct viewpoint] of the church. The fascinating thing about this argument by the Roman Catholic Church against the original reformers, is that the Anabaptists used the EXACT SAME ARGUMENT against the reformers to justify their split . . . and it has been the same ever since. Thousands of churches; hundreds of denominations. Each with 'the one and only correct doctrine' about Jesus, God, the bible, the crucifixion, grace, atonement, baptism, the holy spirit, speaking in tongues, dispensations, lack of dispensations, the remnant, etc, etc, etc. Despite my ultimate disagreement with the conclusion of this book, that the reformed church retains the best interpretation of any and all conclusions regarding the christian faith, I feel it is a very necessary read for anyone who want some real insight into how history made the decisions we are stuck with. The Reformation isn't church a period in Church History. While essentially it is, the Reformation also calls all Christians to continually pursue the Lord. This often times means evaluating your own dogmatic practices to determine why we actually do them. For what purpose do they serve? Can the gospel actually be seen in it? Are they biblical? These are only a few questions that Reeves and Chester approach in the book "Why the Reformation Still Matters." It was a great snapshot at not just Marti The Reformation isn't church a period in Church History. While essentially it is, the Reformation also calls all Christians to continually pursue the Lord. This often times means evaluating your own dogmatic practices to determine why we actually do them. For what purpose do they serve? Can the gospel actually be seen in it? Are they biblical? These are only a few questions that Reeves and Chester approach in the book "Why the Reformation Still Matters." It was a great snapshot at not just Martin Luther, but also Calvin and Zwingli. Those three are touted as the fathers of the Reformation. This books helps illuminate the questions of "Why are the theological debates of Arminians and Calvinists important," and also "Has the Catholic Church completely lost its way?" For evangelicals I implore you to read. Understand why there were schisms and fractures in the church. For all christians, don't just follow a pastor because you like the way he preaches, or you like the music, or whatever reason you may be attending that church. Find true Christianity. To find that you need Christ. That is the whole point of the Reformation. He is also theological advisor for Universities and Colleges Christian Fellowship (UCCF), a charity supporting evangelism in higher education throughout the United Kingdom. He was previously associate minister at All Souls Church, Langham Place and holds a doctorate in systematic theology from King’s College London.